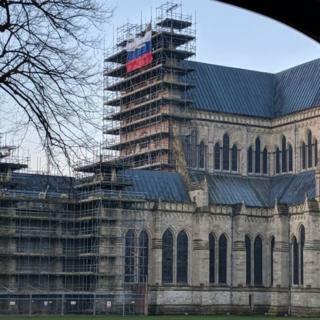 A Russian flag has appeared briefly on scaffolding outside Salisbury Cathedral. It was spotted by workers early on Sunday but has since been removed. John Glen, the city's MP, called it a "stupid stunt" in light of last year's Novichok attack. The poisoning targets were former Russian double-agent Sergei Skripal and his daughter Yulia who collapsed in the city. A woman in nearby Amesbury who was also exposed to it later died. Lee Martin said he noticed the flag, measuring "about 10m long and 7m deep" early on Sunday while he was working in the area. "It's disrespectful and it's antagonising the community after the Novichok attack last year, and with the anniversary that's coming up on 4th March," he continued. Calling it "pathetic", he added: "It's not right that somebody should come and do that." In a tweet MP John Glen said he was "thankful" the flag had been taken down swiftly. "What a stupid stunt - mocking the serious events sadly experienced in Salisbury last year," he said. Wiltshire Police said in relation to the flag it was too early to say whether an offence had been committed but officers were examining CCTV footage from the area. The Dean of Salisbury, the Very Reverend Nicholas Papadopulos, said: "This was a remarkably stupid thing to do and makes light of the huge personal tragedies involved, and the damage done to the city by the unprecedented nerve agent attacks on Salisbury last year." In June 2018, Dawn Sturgess and Charlie Rowley fell ill when they were exposed to the nerve agent by handling a contaminated container in the city's gardens. In an interview with the Guardian newspaper on Saturday her parents said that Ms Sturgess was the only real victim of the poisonings. The UK government said two officers working for Russia's military intelligence service - identified as Anatoliy Chepiga and Alexander Mishkin - carried out the attack against Mr Skripal and his daughter. A third man, Sergey Fedotov, may also have been involved in the poisonings, it is claimed. Moscow has consistently denied any involvement in the Salisbury attacks, which Prime Minister Theresa May said were "almost certainly" sanctioned by Russia.